From a Biology of Genomes poster (pdf) on "Assessment of Whole-Genome capture methodologies on single- and double-stranded ancient DNA libraries from Caribbean and European archaeological human remains" by Ávila-Arcos et al. All that can be said based on this is that they seem broadly southern European and not particularly Tuscan. Certainly these data doesn't demonstrate that Etruscans came from Asia Minor. It seems to me that the link with Modern Tuscans and Iberians demonstrates that Italians and Iberians belong to the same gene pool and it could demonstrate also my theory that R1b-L51 and subclades were brought to Iberia from the Cardials from Italy beginning from 7500 YBP, mostly from Tuscany, and that they have come from Asia Minor becomes more and more unlikely (which is my theory from my first posts). "All that can be said based on this is that they seem broadly southern European and not particularly Tuscan." (1) These Etruscans could not have predominantly descended from a late migration from the Near East. (2) Tuscany has been influenced by southern/eastern gene flow within the past 2500 years. Near Eastern admixture in Tuscany: signal of Etruscans, or medieval slaves? Further evidence that Etruscans didn't come from Anatolia but they descended from the Villanovan culture. I think that these data should be read the other way around, not why Etruscans of 2500 years ago don't coincide perfectly with modern Tuscans or Iberians, but as the witness that Etruscans (i.e. people of Italy of 2500 years ago) are the source of modern Tuscans and Iberians, who have had in these 2500 years other intakes from elsewhere, what we perfectly know from histoy, or genetic drift, but that didn't change them greatly. This criticism is without having read the work, but one thing I will never understand is why researchers choose such outlying groups in PC analysis. Choose several Italians, Iberians, perhaps Italian Swiss, Albanians and Greeks, and see how that is going, and then remove any strong outliers. Finns and C Europeans just dominate PC1 and PC2 and destroy any possibility of recovering useful information, here. n\a your comment makes no sense. The medieval slaves were only in nobles families working as servants as everywhere in Europe. England, Iberia, France, you name it. The source you used there is nothing more than amatuer crap too. As for Etruscans, they are only 3, one of whom is also very close to Tuscans and some Tuscans may clusters with others too btw. Then again it has been found a Neolithic man in Iberia very modern Tuscans' like genetically, so your story that Tuscans have been shifted by medieval slaves, is nothing more than your opinion. I'd say two of the three are rather close to Iberians (IBS), that is rather southwest European, and two of the three have some slight northern shift towards Finns. This certainly cannot be explained with later Celtic and Germanic incursions, so that pattern must have existed since the Etruscan era, at the very least. - According to Hellenthal et al. 2014 modern Tuscans are the result of an admixture event around 942 AD between a French-like and a Cypriot-like population. But still, all of this doesn't prove that the Etruscan language and ethnicity had a northern origin or a very old Italian one. The northern influence may simply be from an IE substrate. The weakness of the southeastern affinity may in part be explained by a low West Asian affinity in southeastern Europe at the time when their ancestors left that area. But since light hair, as Dienekes has pointed out, is rather pre-IE than IE, I don't rule out that the Etruscans were part of the pre-IE central European substrate. But linguistically, they are closer to the pre-Greek Lemnians than to the Raeti. Hopefully, one day we'll have genomes of Etruscans and Lemnians, and we'll be able to see what's common to them. The Protovillanovan of the final Bronze Age was present in the entirety of Italy, from Ascona in Southern Switzerland to Tropea in Calabria, and even in Northeastern Sicily (Milazzo) and on Lipari. But in the South and in many parts of central Italy it was short lived, and it didn't dominate exclusively, inhumation continued to exist in many places. The Protovillanovan had the deepest impact in the area of the later, Iron Age Villanovan culture, and this overlaps strongly with the area where Etruscan was spoken; so strongly that it's unlikely that the Villanovan wasn't Etruscan. But the Protovillanovan was related with the central European Urnfield cultures, especially with the east group. It was related to it, but not identical. Strong similarities with the Protovillanovan were found along the northern Adriatic in Slovenia and Croatia. I think it looks really plausible that the Etruscans came from there, with the Protovillanovan, around 1150 BC according to dendro-dates. Hence the relationship with the Raeti in the eastern Alps. If only there had not been the closely related language on Lemnos. Well, it's still possible that this, too, had a northern origin and arrived there in the turmoils of the Final Bronze Age. PCAs are dataset dependent, so adding a modern population from Southeastern Europe or the Levant could change the PCA a bit. All this PCA shows is that Etruscans were much more similar to Southern Europeans than to Finns or Central Europeans. 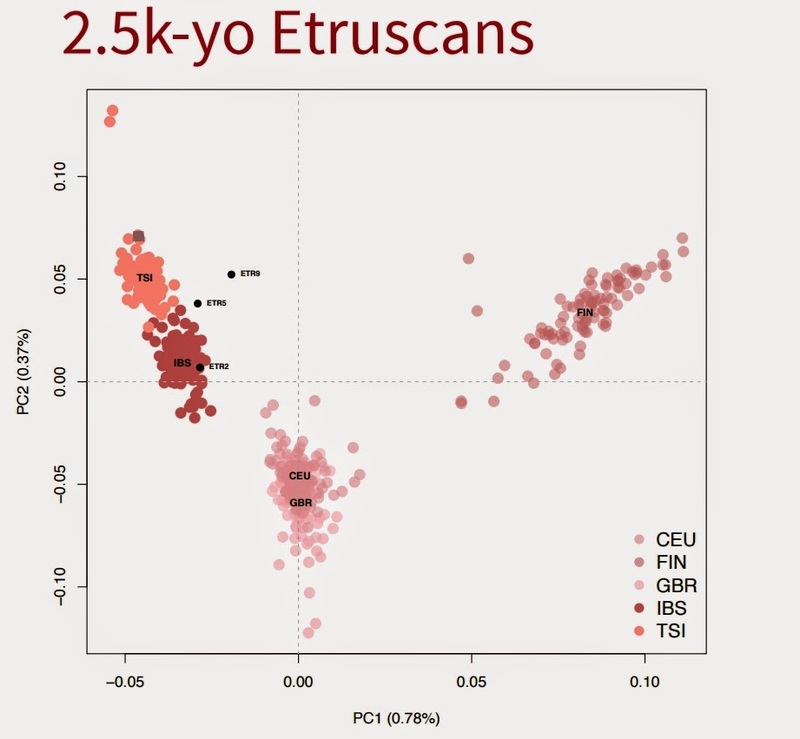 It does seem modern Tuscans pull slightly more Southeast than these Etruscans, but without reference Southeastern populations added to the PCA i would say at the least our understanding is very cloudy. Anyway, We know a lot of Roman slaves were Greek, so modern Tuscans could just have Greek admixture pulling them slightly more to the Southeast than ancient Etruscans. There's no reason to blame it only on Levantines, based on history it's more likely to mostly be Greek. Not to mention again that the PCA is limited without adding Levantines and Southeast Europeans. CEU are white Utahns BTW, not central Europeans. Sure it is, this option certainly fits the evidence. So thought Alinei, who nevertheless was severely criticized for his arguments in favor of a linguistic c.q. vocabulary relatedness between Etruscan and Hungarian (www.continuitas.org/texts/alinei_etruscan.pdf). I am not aware of the same level of rejection for the Osco-Umbrian interpretation of Eteocretan according to Luuk de Ligt, whose study would thus confirm Osco-Umbrian as older and unrelated to Villanovan or Protovillanovan. The relatedness is supposed to be in both vocabulary and grammar. Recently, Bomhard substantiated the Caucasian Substrate Hypothesis with evidence of a quite close vocabulary relatedness between NW Caucassian an Indo European. Similar results exist in comparing the Basque language or Chinese, though these results are apparently unpopular for lacking some accepted hypothesis. The Indo European relatedness with Eurasian languages has been obvious to many linguistic investigators, though the results appear to be virtually limited to grammar and despite many efforts still quite limited concerning any shared vocabulary. Putting the pieces together maybe we are just looking at an old omnipresent and probably Neolithic substrate that coerced a strong vocabulary influence on a thin Uralic superstratum. The Etruscans may have been another relic of this superstratum, albeit for sure not old enough for being the 'missing link'. It may be worth some consideration though that the Indo European 'Uralic' substratum may have been native to Central Europe. Rokus writes: "It may be worth some consideration though that the Indo European 'Uralic' substratum may have been native to Central Europe". Of course I agree with you. I have expressed many times the idea that Indo-European may be formed in Central Europe or the Balkans and not necessarily near the Caucasus. This theory isn't mine but of Giacomo Devoto. It seems that the Uralic languages, clearly the closest ones to IE, streched till the Isles and the link with IE may be happened also in Central Europe. When very likely the origin of R1a and R1b from Western European hunter-gathers is demonstrated through the aDNA, also the origin of the language will be clear. Alinei's theory was severely criticized indeed, it's considered fringe. I haven't delved into that discussion, but I strongly suppose that the criticism was based on valid linguistic grounds, and not on prejudiced views of the archeological evidence. I mean, even if the Etruscans were from somewhere near Hungary, there is absolutely no reason to expect a relationship with Hungarian. Hungarian comes from the Magyars who migrated to Hungary around 900 AD, that's a historical fact. I know that Greenberg considered Etruscan to be part of the Eurasiatic macrofamily, which in his view is a rather northern complex of language families, which also includes Uralic and IE. But that's highly speculative, he presented little evidence, and it's hard to rule out chance resemblances. And the existence of Eurasiatic isn't accepted by mainstream linguists anyway. Yes, we have discussed about de Ligt's theory. But even if Oscan-Umbrian wasn't related with the Protovillanovan, this isn't true support for de Ligt's interpretation of Eteocretan. The validness of the latter has to be determined on purely linguistic grounds. However, given the fact that the Middle Bronze Age Apennine culture stretched along the entire „boot“ of Italy, I have absolutely no problem accepting the presence of the varied, but closely related Italic tribes in this entire area during the Middle Bronze Age. With regards to your concluding speculations, Indo-European isn't Uralic, period. And the theory of a central European homeland of IE has been severely losing ground lately, in the light of increasing paleo-genomic evidence. There is absolutely no evidence for an ancient Uralic presence on the British Isles. To the contrary, the spread of the Uralic languages appears to have happened quite late and together with y-haplogroup N and ENA admixture, mind you, ENA, not ANE. A PIE homeland in Western Europe is extremely unlikely and not supported by any evidence. I would even go so far to say: It's against reason. The same holds true for the origin of R1a and R1b in Western Europe. That said, I don't share your confidence that wherever R1b originated there must have been the PIE homeland. In fact, both R1a and R1b are much older than PIE. We can be dead sure that the places where they originated have nothing to do with the PIE Urheimat. I meant to say: It may be worth some consideration though that the Indo European 'Uralic' superstratum may have been native to Central Europe. This has to be understood with Bomhard's recent substantiation of the Caucasian Substrate Hypothesis with evidence of a quite close vocabulary relatedness between NW Caucassian an Indo European. No, Indo-European indeed isn't Uralic, but this isn't the end of it. According to the hypothesis Indo European didn't exist at all before Uralic and NW Caucassian met. Thus, the Indo-European would be some kind of Creole. The lexicon of a creole language is largely supplied by the parent languages, while the grammar often has original features that may differ substantially from those of the parent languages. Ever more, female and autosomal DNA evidence attest nothing but an international meltingpot with extensive marriage partner exchange, while paternal DNA still indicate rather a patchwork of superstrata over an enormous area. A punctuated origin of IE languages still has to be found, while the approach of a broader homeland was discredited by Mallory. This war of conflicting insights is political rather than intellectual and has traditionally been fought with guts rather than brains. To me, the latest investigations strongly disprove a punctuated origin in Yamnaya and even more strongly in Sredny Stog. Well, believes are no science and even when thousands recite their mantra for decennia this doesn't make a scientific fact nor does it invalidate counter evidence, it just makes humanity more stupid. I have been in favor of the Caucasian Substrate Hypothesis for a long time, but I reject e.g. Kortlandt's imperative of a contact zone limited to, or maybe even including, Ukraine. The Neolithic fanned out over most of Europe and it can't be excluded that Basque came from the same Neolithic root language, to indicate the geographic extend of the Caucasian substrate - I have to stress again that vocabulary similarity has also been attested for Basque. IE language diversification thus may have had a headstart if creolization happened within the framework of a Mallory-style broader (Mesolithic) homeland, or wider still having the whole of Neolithic Europe as a potential substrate. For instance, similarities between creoles in phylogenetic and typological comparisons, of course, where higher in the Caribbean for being derived from related languages in western Europe, that moreover converged into the grouping of Standard Average European. Another example of unexpected relatedness of mixed languages over a wide area can be found in Romance languages, that are each more related to each other than to Latin and still share a considerable set of Germanic vocabulary. Hispanics of South America can understand Rumanian without much difficulty, while none can understand Latin. The same might have happened in the genesis of Indo European, where all groups have grammatic and vocabulary peculiarities that set them apart from a simple phylogenetic approach: eg. shared Germano-Ialic pre-IE vocabularity and the lack of an IE-like gender system in Anatolian languages. Then returning to professor emeritus Alinei. Despite being opposed by linguists whose mindset totally agree with the Biblical proposition that Earth can't be older than about 6000 years old, he could produce some elegant translations of Etruscan texts where nobody else could, using Hungarian as a reference. Unfortunately, the body of Etruscan inscriptions is quite limited so his efforts indeed remain tentative. However, I don't have any difficulty with the possible implications. Interesting is Alinei's observation of an alleged Turkish vocabulary in Hungarian-Etruscan, thus possibly implying a mixed superstratum. Within the framework of the Caucasian Substrate Hypothesis only extremely few Uralic words could be considered to have found their way to Indo-European, though this may be different for a second "Altaic" superstratum layer. What about a Germanic word like 'King", that can't be found in any other IE language group, would this be in agreement with the existence of a YDNA patchwork of superstrata? Or otherwise the lack of this mixture in other Ugrian languages could be well in agreement with IE having migrated to the east (Afanasievo!) already fully prefabricated. Sure, all of this is speculation. However, nothing has ever been achieved without speculation. When I began interesting me on genetics, after having been found hg. R1b from DNAHeritage, the theory was that exposed by Vincent Vizachero of the previous "R1b1 FTDNA Project" and unchanged so far: R1b came from Middle East. I have fought many years and many banishments against that theory, diffused not only amongst Jews but also amongst Christians for religious and political reasons. It seems to me that my theory of an "Italian Refugium" and of the origin of R1a-M420*, R1b1-V88*, R1b1-L389* in Western Europe is beeing winning. A little tests more and everything will be done. About the languages of course it isn't necessary that my theory needs a link between genetics and linguistics, but that there is a link between hg. R1a and IE satem languages and R1b and IE centum ones is difficulty deniable. Of course during the LGM the hunter-gatherers R1a and R1b didn't speak IE, but all the theories of the kurganists don't fit. If they were groups of R-L23 chiftains from Yamnaya to expand IE, I should be glad, because I descended from them, but my R-L23-Z2110 is in Western Europe long before Yamnaya, and from the close to it Western European CTS7556 came all the R-L23 (CTS9219) of Eastern Europe and not the other way around. Thus if I said that IE languages 1) didn't come from Middle East but from Europe for their close link with Uralic languages 2) they already presuppose a division centum/satem linked very likely with a division R1a/R1b 3) that division has to be happened in Europe, and from Eastern Europe the satem languages colonized Asia. Of course we are waiting that the YFull tree ages are updated, because with these ages the expansion of the R1b subclades downstream R-P312 from Iberia is a little deniable, but it wouldn't explain the huge presence of R-U152 in Italy and Central Europe. I am saying from so long that I esteem those dates underestimated for at least 1000/1500 years for the more recent times. They have already carried the division from R1a and R1b from 22200 to 24400 years. With the true ages, we'll be able to understand more also about that. I think that YFull bases its ages upon the culture (i.e. Bell Beakers) whereas should be the other way around. "Sure, all of this is speculation. However, nothing has ever been achieved without speculation." And that is what I like you, for. At any rate, I agree that "pre-proto" Uralic languages must have been widely-spread in Europe, at one point, predating pre-proto IE, and forming a proto-IE substrate of varying proportion and varying age and provenance throughout much of at least Central and perhaps Western Europe. What recent findings in ancient DNA have shown: Yamnaya was a mix of Eastern hunter-gatherers and Armenian-like people. And Corded Ware was a close relative of Yamnaya with only minor Middle Neolithic Farmer admixture. There was a resurgence of Western hunter-gatherers in the course of the Middle Neolithic, but it was rather modest. And afterwards, in the late Neolithic there was a massive influx of Corded people from the east. In cases of massive migration like this it's extremely unlikely that the migrants adopt the language of the locals, who are in the minority. That's what the autosomal evidence suggests. But you prefer to ignore it, because it doesn't gel with your pet theory. Speaking of beliefs, mantras and creationist mindset... You're not really taking the genetic evidence seriously, that's the problem. I don't believe that native speakers of Spanish can easily understand Romanian. Perhaps written, and with the aid of a dictionary. The Romance languages are rather like a continuum of dialects, where each pair of neighbouring dialects are mutually intelligible, but more distant pairs are not. At least, that's what it has been like for centuries. But more recently, with the trend towards national standardization, the chain got broken. And what you wrote about Creole languages doesn't explain why words for Chalcolithic items don't look like loans, but like inherited from the proto-language, because they conform to the systematic sound changes that distinguish the daughter languages from PIE. Loan words ususally don't conform to this, if they were adopted after the sound changes had occured. For instance none of the Latin loanwords in Germanic languages conform to the Germanic sound shift. Alinei's seemingly elegant translations of Etruscan as Hungaro-Turkic show us most of all one thing: That one has to be cautious and that the mere existence of a reading proposal doesn't prove that the reading is correct. The Proto-Germanic word for „king“, kuningaz, is related with Proto-Germanic kunjam, meaning a House, in the sense of a family lineage. So the kuningaz is originally a man of a certain House, of a noble one at that. And Germanic kunjam is related with Latin genus, and moreover with all words derived from the PIE root gen-, meaning to generate, to give birth: Sanskrit jatah, which is parallel to Latin natus (Old Latin: gnatus, Gaulish gnatos), Greek gignesthai (to come into being), Latin gignere (to generate, to give birth). So king can be derived quite normally from a PIE root. The difference is just that other IE languages generated their word for the institution „king“ with different language material. And yes, the word kuningaz was adopted by the Finns, but given the northern location of the Proto-Germanics, in the neighbourhood of the Finns, this isn't overly surprising. Speculation is fun, but it has to be based on firm knowledge of facts, otherwise it's useless. And as for the Etruscan topic, I forgot to add that I prefer to derive them from Pelasgians, from the Aegean, that is. Etruscan is just closer to Lemnian than to Raetic, and the Protovillanovan was probably Ligurian, not Etruscan. This is most evident in the close y-chromosomal similarity between northern, especially northwestern Italy and Tuscany. This is most of all due to the high frequency of R1b-S116 and R1b-U152. These haplogroups, undoubtedly of central European origin, reached Northern Italy apparently after the early Bronze Age, in the Middle Bronze Age, when cremation became common. The Early Bronze Age North Italian from the latest Allentoft et al. paper was still an I2. And the cremation custom reached central and southern Italy no earlier than the Final Bronze Age, that is, with the Protovillanovan, and this was most probably the time when R1b-U152 and S116 entered the rest of Italy. And in case someone doubts that Ligurians were ever present south of Northern Italy, according to some ancient authors the Sicels were Ligurians and were one of the earliest people of central Italy, before they were expelled by Latins, Pelasgians and Umbri. In line with that, R1b-P152 is again somewhat more common in Sicily than in southern and east central Italy. The map on the left shows the archeological cultures of Italy at the beginning of the Iron Age. The dark and the grey areas are dominated by cremation burials. The white areas are almost exclusively with inhumation burials. The map on the right shows the incidence of R1b-U152/S28. There is a remarkable correspondence between cremation burials and high incidence of R1b-U152. In Northern Italy the cremation custom became common in the Middle Bronze Age. In the early Bronze Age, inhumation was still the standard. RISE486 lived around 1950 BC in Northern Italy, that is, in the Early Bronze Age. And he's still I2, not R1b. So chances are high that R1b arrived in northern Italy during the Middle Bronze Age, together with cremation. In central Italy cremation didn't get common before the Final Bronze Age. It arised there with the advent of the Protovillanovan. The exact origin and ethnic affiliation of the Protovillanovan is still uncertain, but it's related with the Urnfield cultures of Central Europe, and hence it makes sense that it introduced the central European haplogroup R1b-U152 to the rest of Italy. This first PC is strongly loaded by R1b-U152, to a lesser degree also by R1b-S116 and R1b-L2 (all R1b variants which must have come from the north). Therefore I think that the Protovillanovan was ethnically Ligurian IE (which is related with Celtic) and that the Italics arrived earlier, from the southern Balkans. Hence their high incidence of J2 and the strong West Asian admixture. Etruscan then must be from some pre-existing group of central Italy which assimilated the Ligurians. Where have you studied linguistics? "For instance none of the Latin loanwords in Germanic languages conform to the Germanic sound shift". What I cannot understand in the comments is when i read something like "Further evidence that Etruscans didn't come from Anatolia but they descended from the Villanovan culture". I think the study proves the opposite, and the key to prove it is in that '2500 years'. By 500 b.C. settlers from anatolia had been interbreeding in Italy for as much as 300 years, that is, over 8 generations. The villanovan culture had 2 periods, the Proto-V. (XII - X century b.C.) and the proper-V. (X - VII century b.C.) the latter being the one when they 'got hellenized' according to the scholars. By the VII century b.C. etruscans where settled in italy by 1 century as a minimum, according to the hystorical records. If etruscan were a part of proper-villanovans they would have shown a continuity with their culture, which they did not (e.g. : villanovan lived in the inland, and were never sailors // villanovan carved, did not paint, 90% geometrical motifs, while early etruscan vessels and plates were painted with burial or mondane scenes). The picture that delineates, instead, if that of a group of anatolians that came to Italy around the VIII century b.C. and interbred with the local populations, producing in the time of 5-8 generations a 'new' people which we now kow call as 'etruscan' who called themselves 'Rasenna'. The term, also, is indicative of a hellenic / analolian origin, since it may be the origin of the otherwise unexplained italian term 'rasato / verb: rasare' = shaved / to shave. Most of the estruscan and anatolian pictures in the I millennium b.C. show mundane people with shaved cheecks, and only a goat beard. Back when i worked at the Museo Sanna of Sassari i had seen a huge collection of etruscan plates and i may say that 95% of the people pictured in etruscan material were shaved. All this backs the linguistic part, which i have studied at the university of sassari with Massimo Pittau, one of the most experts in he etruscan language. Etruscan is very similar with western-anatolian in a huge number of features. The genetical record also has often been misunderstood... in 2013 girotto & barbujani said that they found diversification between anatolians and italians 'not later than 5000 years ago' so many saw this as a proof that anatolian could not arrive in italy in the 1st millennium b.C. The problem is, girotto & barbujani in their paper calculated the 5000 years diversion point theorizing a 'complete isolation' in these 5000 years, which did not occur. For those who understand italian, i wrote a paper some years ago to summarize the hystorical-geographical-linguistical-genetic aspects of the 'etruscan problem'. "The term, also, is indicative of a hellenic / anatolian origin, since it may be the origin of the otherwise unexplained italian term 'rasato / verb: rasare' = shaved / to shave". It would have been enough having read every dictionary of the Italian language: "Lat. volg. *rasare, intensivo di radere". I'm sorry he knew a person like Massimo Pittau, otherwise a serious scholar. All what demontis says, also from a genetic point of view, lacks any fundament, and I don't give him the same treatment I gave on "Eurogenes blog" to another person in respect to the same Pittau and all Sardinians, who are giving a greatest contribute for understanding the past of Europe with their DNA tested by Francalacci and his team. italian rasare -> radere from latin radere -> rasus which is still unexplaied ethimologically. So yes, the italian word is of latin origin, but the latin origin is not explained (as attested in: Ernout A. - Meillet A., Dictionnaire Étymologique de la Langue Latine, Paris 1985; Cortelazzo M. - Zolli P., Dizionario Etimologico della Lingua Italiana, Bologna, I-V, 1979-1988; II ediz. 1999). And i am one of those sardinians you talk about. As for where i studied linguistic, it was the university of sassari. You only need to read my paper, or pittau's work, or mel copeland's work, to find the linguistic evidence of an anatolian origin of the etruscan language. It is funny you say that my genetic analysis lacks any fundament because what i said about etruscan genetics is exactlly what comes from the studies by barbujani, ghirotto, caramelli, fumagalli etc. Byt again, it's all summarized in my paper. "Therefore I think that the Protovillanovan was ethnically Ligurian IE (which is related with Celtic) and that the Italics arrived earlier, from the southern Balkans. " Sure, Italic arrived earlier - around ~1,500 BCE. But more from the NW Balkans / E Alpine region, IMO, to be consistent with other European IE groups. It is the later strong Greek influence onto Italic that makes it look more S Balkan. That isn't the Germanic sound shift, but the High German consonant shift. It only affected High German, which includes standard German. This shift occured much later than the Germanic shift, that's why it also affected Latin loans. 1) I read in the past many Pittau's books, even though he is considered a weird researcher in Academy world. This writing and its ideas are ridiculous. 2) I always read everything about an argument before speaking about it. I read your "paper": it seems the first version of a thesis which hadn't the second: in a scientific paper no one speaks of the circumstancies, only private, of the author of the paper. 3) Those researchers you spoke about are only leftists followers of the first leftist who for ideological reasons said that Italians aren't Italians but they always came from elsewhere. The same Barbujani (I always call Farfugliani) said that there was a link between Etruscans and Asia Minor but in his last papers he says that that link is old many thousands of years and not from the Etruscan time. Not serious. I have broken in pieces many papers of these researchers. The last about the Arbereshe, whose the same Dienekes spoke about here, presents as R-L51 many haplotypes which are R-L23 "Balkan cluster" (definition and discovery is mine). 4) I find interesting that you were amongst the samples of Francalacci's research, thus beyond himself and Tofanelli not all came from medical samples. There is a Demontis belonging to hg. G on Ysearch. Of course your surname is diffused overall in Sardinia and may belong to many different lines, but we are speaking a lot about hg. G and its ancientness in Sardinia and Italy in some FB blogs, those of Asciak's. If you by chance belonged to hg. R1b1-M18, I'd paid for a test, because upon that is based my theory that R-V88 comes from Sardinia-Italy or Iberia rather than Middle East. "That isn't the Germanic sound shift, but the High German consonant shift. It only affected High German, which includes standard German. This shift occured much later than the Germanic shift, that's why it also affected Latin loans".